A new study of African savannah elephant populations in Angola by wildlife ecologists from Elephants Without Borders (EWB) and the University of Massachusetts Amherst reports today that though the population seemed to be recovering after the war ended there, that trend has now reversed, underlining “the need to be vigilant against poaching and habitat loss,” says first author Scott Schlossberg. He and colleagues write, “There may be time to reverse the ongoing decline of elephants in Angola and conserve this important population” if the government commits to “active protection.” Schlossberg and Chase of the Botswana-based conservation group did this work with co-author Curtice Griffin, professor of environmental conservation at UMass Amherst. Details appear in PLOS ONE. The authors note, “Fortunately, as of late 2015, Angola still had over 3,000 elephants.” Before the 1970s, as many as 70,000 elephants lived in Angola, one of the largest populations in southern Africa at the time, and a key link between populations in Namibia and Botswana. However, war from 1975 to 2002 saw great loss of human life and reports of elephants slaughtered on a mass scale. In 2004-05, Chase and Griffin were able to conduct the first systematic survey in 25 years and they found a “small but apparently healthy and growing population estimated at 1,800 elephants.” For the next 10 years, no elephant research was possible in Angola, but in 2015, the government granted EWB permission to resume research. Chase was Griffin’s graduate student when he founded EWB at UMass Amherst in 2007. 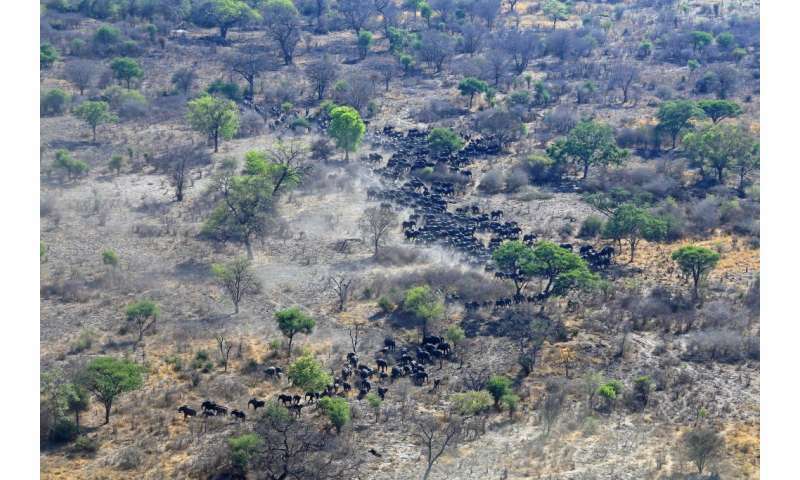 For the current work, the researchers say they used aerial surveys and satellite monitoring of eight collared elephants to determine the current status of populations in Angola and to learn how humans may be affecting elephant habitat. The aerial survey revealed a population of 3,395 elephants. This was a decrease of 21 percent measured in a subset of the 2015 study-area that was surveyed in 2005, Schlossberg explains. The study was conducted in the Cuando-Cubango province of southeast Angola, where the 2015 survey as part of the Great Elephant Census in a 43,459 square-km area, mostly in the newly created Luengue Luiana National Park. Four major rivers cross the area and settlements are found along them. Minefields left from war still remain and have caused injury to humans and wildlife, including elephants, they add. Schlossberg and colleagues report that the number of elephant carcasses observed increased greatly between 2005 when none were seen, to 2015 when approximately four carcasses were seen for every 10 live elephants. A major finding of this study, say Schlossberg and colleagues, is that human development is widespread in southeast Angola and may be limiting elephant distributions. Satellite tracking showed that elephants avoid areas within 6 km of human indicators. “Growing human populations may be displacing elephants from their preferred habitats in Angola,” Schlossberg says. 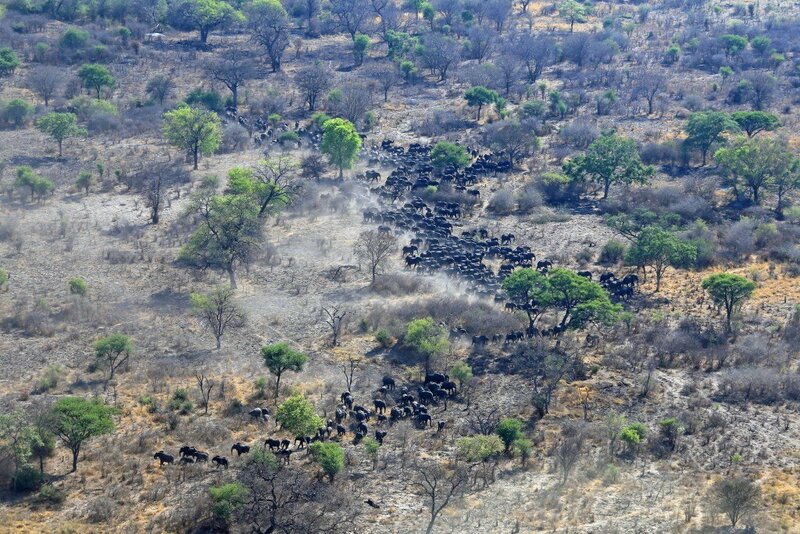 The team notes that to conserve elephants in southern Africa, conservationists have proposed establishing the Kavango-Zambezi Transfrontier Conservation Area (KAZA TFCA) to protect core habitats and movement corridors between Angola, Botswana, Namibia, Zambia and Zimbabwe. But their data suggest that increased poaching in the region would threaten the integrity of the proposed KAZA TFCA and greatly diminish elephants’ ability to move around safely.